English ivy plants (Hedera helix) are climbing vines that are very ornamental and stylish with three to five-lobed evergreen, glossy leaves. They are also known for their richly-colored foliage that comes in a mixture of whites and deep greens and yellow gold. These easy-care plants can thrive in low light conditions and make a wonderful indoor houseplant. They are vigorous climbers covering trellises, walls, railings, fences, arbors or any other structure they can cling their roots to; but are typically used indoors as trailing plants in hanging baskets and as potted plants that cascade down. formaldehyde, xylene, trichloroethylene and benzene. When the toxins are removed life-sustaining oxygen is added to air you breathe. You can improve your indoor air By placing one large plant or two smaller plants (4-to-5 inch pots) every 100 square feet in your living space. Light: Medium to high light (near bright east or south window) Will thrive in fluorescent light and tolerate low light. Watering: Water thoroughly, then allow the soil to drain and empty excess water; then allow the top one inch of soil to dry slightly to touch between waterings. A well-draining potting mixture should be used. This is necessary to prevent root rot which can kill your plant. Water using tepid or warm water. Salt in tap water is detrimental to plant, use distilled or rainwater. Temperature: Air temperatures between 50 to 75 degrees Fahrenheit. Can tolerate 35 degrees Fahrenheit without damage. Humidity: Mist houseplant with warm water daily or every other day during the spring and summer or place on a humidity tray to keep humidity levels around the plant slightly elevated. 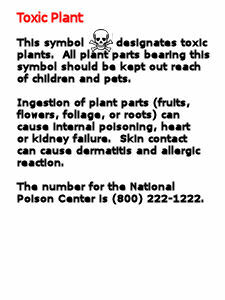 Fertilizer: Feed your plant once every two weeks with a liquid balanced houseplant fertilizer when it is actively growing during the spring, summer and early autumn, following the instructions on the label. Pruning: Pinch back the tips of the vines once a month while it is actively growing to encourage healthy growth and to control its size. Pests: Watch out for insects such as scales, mealybugs, aphids and spider mites. If you detect any insect on your plant, treat the plant with an appropriate horticultural oil, insecticidal soap or insecticide spray. Grooming: Clean the leaves by wiping them with a damp cloth to remove any dust and grease. You can also rinse the entire plant with water from a hose spray nozzle attachment. pets. It is poisonous if eaten.